Veteran NBA referee Bill Kennedy has revealed he is gay after being the subject of homophobic insults from Sacramento guard Rajon Rondo. Kennedy was confronted by Rondo after ejecting him on two technical fouls during the game between the Kings and Boston Celtcs in Mexico on 3 December. 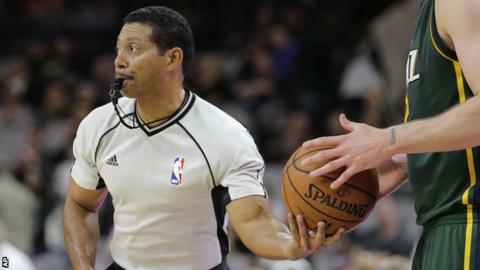 "I am proud to be an NBA referee and I am proud to be a gay man," said Kennedy, an official for 18 seasons. "My actions were out of frustration and emotion, period," tweeted Rondo. "They absolutely do not reflect my feelings toward the LGBT community. I did not mean to offend or disrespect anyone." The Sacramento player was banned for one game for his actions. NBA commissioner Adam Silver stated: "I wholeheartedly support Bill's decision to live his life proudly and openly. "Throughout his 18-year career with the league, Bill has excelled as a referee because of his passion, dedication and courage. Those qualities will continue to serve him well both as a game official and as a positive influence for others." Kennedy, 49, has officiated 1,056 NBA games and 68 play-off contests, including five NBA Finals matches. He also worked at the 2010 World Championships and 2012 London Olympics. He added: "I am following in the footsteps of others who have self-identified in the hopes that will send a message to young men and women in sports that you must allow no-one to make you feel ashamed of who you are." Kennedy is the second NBA referee to announce being gay after Violet Palmer made the same declaration in 2014 upon marrying her long-time partner.